figure3 has recently delivered a new headquarters design for Coca-Cola located in downtown Toronto. 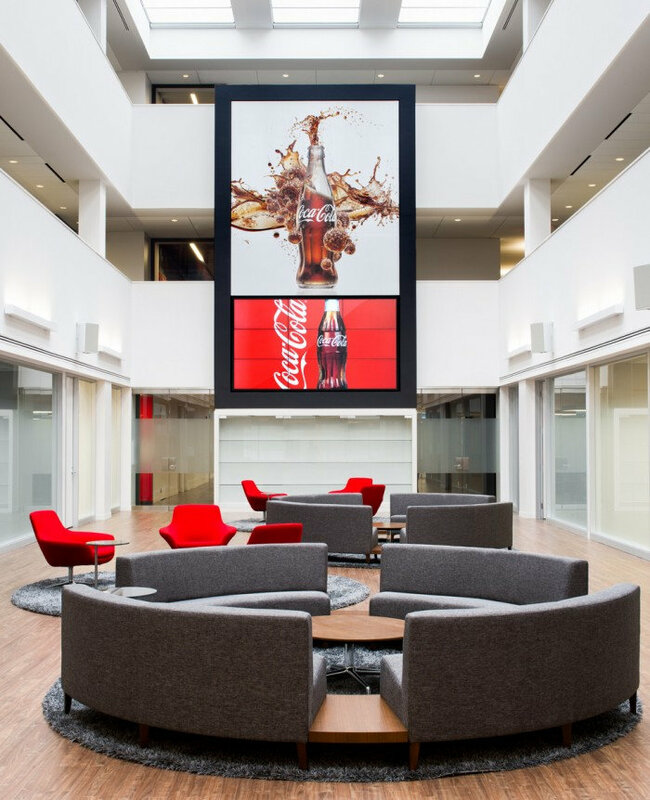 The 100,000 square foot office is designed using a combination of social spaces, focus spaces, brand experiences, and conference areas to both bring balance to the workplace and make it work best for Coca-Cola’s Toronto staff. Coca-Cola is the world’s number one brand. In 2010, the company acquired the North American operations of Coca-Cola Enterprises so Coca-Cola Canada was faced with the challenge of merging the newly consolidated business units into a single headquarters. The company made the daring decision to abandon their suburban offices and move everyone to the heart of downtown Toronto – a bold choice, geared at attracting and retaining top talent to work for Coke. This required a unique real estate solution – urban and in sync with Coca-Cola’s Live Positively global platform Live Positively is Coca-Cola’s commitment to making a positive difference in the world by redesigning the way we work and live so that people and sustainability are integral. The headquarters also needed to embody the brand promise of delivering happiness, which meant that a lightness and sense of playfulness needed to be incorporated into the design – it is Coca-Cola after all, a brand synonymous with sunny days, happy memories and celebration. To VP of Innovation and Entrepreneurship, David Butler, “The Coca-Cola brand is about bringing happiness to people, refreshing the world.” Butler says that measuring the impact on people and the environment is just as important as top-line growth so the new workplace had large shoes to fill. The space needed to speak to the promise of delivering happiness by telling the brand story and paying homage to Coca-Cola’s incredible legacy, while focusing on the people who make the company what it is today. So what does a people-first design look like? From the studs to the ceilings, every single design element needed to answer two questions: Does this work for our people? Does it respect the environment? Creating a physical work environment fundamentally built around people was a unique opportunity for Toronto-based design firm figure3 to dream up a workplace that could. Four strategic zones were created, each specially designed to speak to people-centric principles: Celebrate (social spaces), Engage (conferencing areas), Delight (experiential ‘brand’ spaces) and Centred (focused work spaces). Celebrate, located at the base of a 3-storey atrium is a sunlit grand hall that serves as breakout spaces and town hall area, with circular seating areas rooted by a giant corporate messaging screen. An informal employee cafeteria and outdoor terrace flank the space. Celebrate encourages conversation, laughter and chance encounters. Meeting rooms outfitted with conferencing tables and lounges surround the atrium – an engaging zone for all employees and visitors to connect and collaborate. Portals – brand-inspired corridors – are the delight zones, drawing people from public to private spaces with bold and informative imagery depicting Coca-Cola’s global, local and personal impact. The portals serve as decompression areas, separating the activity and buzz of the more public spaces from the quiet centred zones of the workspaces on each floor. The open areas feature internal private offices with glazed fronts and views of the Toronto skyline and lake for every single employee. The desking product is a non-panel solution that gives the open office environment a fresh, residential appeal in white and wood veneer finishes. The centred zones are focused and minimalist but still invoke the brand’s sense of fun with Coke products and paraphernalia accenting the space. By working hand in hand with stakeholders to address the relocation of 400 employees, right-sizing the consolidated organization to eliminate redundancies and developing a workspace design adaptable to accommodating changing needs, the space embodies the organization’s people-first platform. Coca-Cola is global but the Toronto headquarters, one hundred per cent Canadian.